Our most aggressive coating! 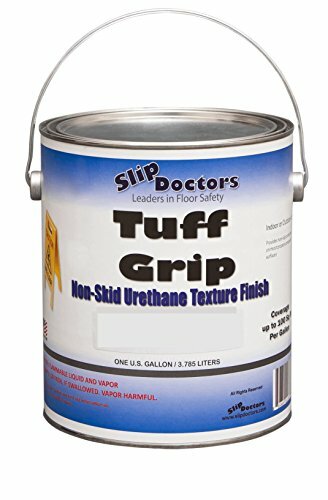 Tuff Grip can be used inside or outside to make any floor anti-skid. Ideal for concrete, metal or wood surface where maximum traction is needed. Popular uses are on loading ramps, roof top walkways, warehouse floors, garage floors, etc. This one-part non-slip coating is environmentally and user friendly. Tuff Grip's durability is chip, scuff and impact resistant. To apply, roll on the coating with most brushes or rollers, and a textured surface is created! This coating air dries quickly. Now available in CLEAR! Contact us if you need dry times under 6 hours. Guaranteed with our 2 year warranty and always in stock for same day shipping! Please contact us for bulk orders over 20 gallons.